Inspired by Threes!, Target Number is another mathematics related game that has been released recently on Google Play. However, unlike Threes!, Target Number is not a game where you have to visualize your future moves before and guess what the board would look like after an n number of moves. Also, unlike Threes!, here you do have to use your math finesse to do some calculations and cross a level. In Target Number, you have 12 buttons with 6 numbers and 4 arithmetic operations and in the middle is a target number that you have to generate by using the provided numbers and the arithmetic operations. The other two are the Undo button and the Hint button. The available numbers can be used only once but the results you get out of their manipulation can be further used. So, enough about the game mechanics, let's move on to how the game is like! Target Number is not as addicting as Threes! but holds its own fort to work up your brain solving basic but hard to figure out mathematical problems with a notepad in your hand. Target Number brings back those simple math problems which we used to solve in our childhood just for fun (not sure if I was only that geeky ;) ) and gives you a taste of your own math efficiency in this time when most of us rely on our smart gadgets to do the calculations for us. 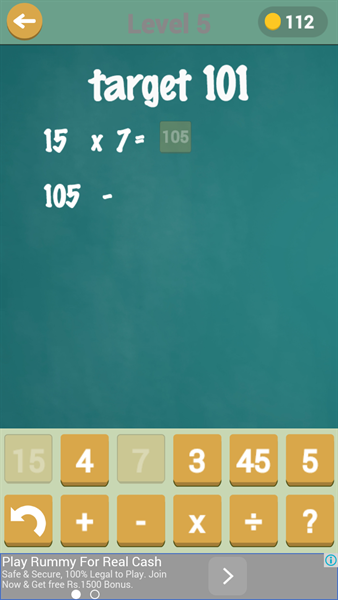 The starting levels start with simple calculations where you would probably be able to see the answer directly by seeing the available numbers. But by the time you reach level 10 or so the puzzle start to become a little complex meaning that you will have to do a little trial and error to actually find the solution to the puzzle. There will be times when the answer is right in front of you but it just won't click and then there will be higher levels which will seem like why are such easy puzzles present at such high levels. As it involves multiple tries of numbers and operators before you are able to clear the level, it can get a little tiring to continue solving math puzzles so I won't say that the game is addicting for most of the average gamers. However, for those who like solving math puzzles, Target Number can be a fun time exercising their minds in something that they like to do. And for those who want to re-ignite their interest in maths, this is a nice app to spend some time with and increase your aptitude along with it. Each level you cross, you are awarded coins which keep adding up to your account. You can use these coins to get hints if you are stuck and want some help. I used the hint feature and had to spend 30 coins to get one hint. That is quite costly and means that you will be careful when you want to take hints to solve the puzzle. Target Number is not a game you get addicted to or play for a long time. It is something you play when either you want to improve your aptitude or are a math aficionado. Enjoy this game on your Android smartphone if you fall in either of the categories otherwise, do give it a try if you have enjoyed solving complex math problems in your childhood too!